First thing’s first: don’t mark your books. Just don’t do it. It may be extremely tempting to write your name with ink or pencil in your book, but doing so will significantly decrease its value. If you have already made the unfortunate mistake of writing your name with ink inside of a collectible book, do not make the situation worse by trying, in any way whatsoever, to remove it, disguise it, blot it out or cover it. And yes, even pencil will decrease the value of a collectible book, because try as you may to erase it with care, the evidence of markings will remain. Typical erasers are made with synthetic rubber which will leave behind unsightly marks, and even the more expensive art gum erasers leave behind dust that is difficult to sweep away without risking leaving behind marks. Unless you plan never to sell your books, there is no good reason to write your name in a collectible book. Which leads me to: don’t loan them out. Most people write their name in a book so that in the event they loan the book to someone, that someone is less likely to “forget” from whom they borrowed it. Lending out your collectible books is just a bad idea. Ownership markings aside, once a book is out of your possession, its care is out of your control. Do you really want the task of painstakingly examining all 823 pages of your Signed Limited First Deluxe Edition “The Stand” by Stephen King upon the book’s return to your possession for potential damage? No. The alternative to writing your name inside a book is to use bookplates. While this may seem like a wise alternative, it’s not. Bookplates greatly decrease the value of a collectible book. Even fancy, custom designed bookplates. Notable exception: if your name is Johnny Depp or Paul McCartney, go ahead and write your name on that bookplate or scrawl it with ink directly into the book to your heart’s content, because when some lucky soul stumbles upon it and gets it authenticated, you’ll be financing their retirement. Not all bookshelves are created equal and there is a lot more that goes into proper shelving of books than you might think. The first thing you want to do when selecting a bookshelf for your collection is to make sure the shelves offer your books enough head-space and that the shelves are deep enough so that your books have a few inches of space behind them and in front of them. Books should never be pushed all the way in so that they are flush with the back wall of the bookshelf and they should have enough room so that they are not sticking out beyond the front end of the shelf. Books should be placed upright so that they support one another, and it is best to place books of equal height next to each other to maximize this support. Don’t try to fit more books on a shelf than is advisable by cramming them in tightly. Likewise, don’t shelve them so loosely that they lean to one side because this causes damage to the spine. Left in that position for too long, the spine will become warped. If you have extra space on the shelf, use high quality bookends. Oversized books or ones with exceptionally heavy text blocks should be stored flat on their sides to prevent the text block from separating from the binding; but do not pile books on top of one another. It is advisable that you choose a bookshelf free of paint, varnish, lacquer or other finishes because a book’s surface can absorb the chemicals. Additionally, shelving books bound in like materials side by side is preferable. Cloth bindings should not be shelved next to leather bindings because the oils in the leather (yes, there are oils) can damage a cloth binding. Food and drink are a big no-no. Do not open the book to capacity (180° angle). Thus begins deterioration of the spine and text block. Do not place the book face down to save your page. Use an acid-free bookmark. Use an archival quality dust jacket cover, made of Mylar or polyester film. Remove a book from the shelf by placing your hand firmly on both sides of the center of the book, allowing adjacent books to be gently pushed toward the back wall of the shelf. Along with allowing air circulation, that’s what the extra inches behind the books are there for. Never grab the book at the top by using your finger as a hook to pull it out by the spine. When it comes time to clean your books and their abode, you can use a feather duster on the books and a magnetic cloth to dust the shelf. Hold the book, offering it support, in the same manner you remove the book from its shelf and dust lightly. If for some reason the edges of the binding have become soiled by excessive dust, you can also use (gently) a magnetic cloth. Just make sure it is a magnetic cloth and not a chemically treated, household “dust cloth.” They’re not the same. Never use a magnetic cloth on a book that has already been used to dust the shelf on which it sits. Keep your bookshelves is a cool, dry place, away from direct sunlight or other ultraviolet sources, harsh fluorescents, moisture or heat. Ultraviolet rays will fade dust jackets and cloth bindings, and cause leather bindings to dry out and crack. Heat will cause bindings to dry out and warp. And moisture reeks havoc on books, causing wrinkled pages, degradation to bindings, and even mildew. If you absolutely must temporarily store your books, just get that idea of heading over to your local liquor store or grocery store for “free boxes” right out of your head. You’ll regret it. Invest in pH-neutral book boxes because regular ole boxes contain acidic properties. Place the books inside the box in much the same manner they are placed on a shelf. The books should be upright, side by side, packed securely to remain upright, but not jam packed. 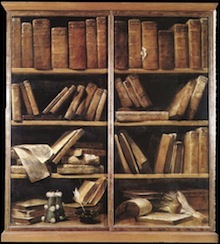 If there is room at the top, do not place additional books flat on their sides, even if the upright books are identical in height. Never stack boxes on top of one another for any length of time. If you’re boxing up your books for a move, and space on your moving truck is an issue, stack with caution. It’s advisable to stack no more than two boxes in such a case, and of course, placing the heavier of the two on the bottom. Put the books in the truck early so they are closer to the front, and though you may be tempted, do not stack them high on top of furniture or other items in the truck. Earthquakes happen and you want to make sure you are prepared. Here is some useful information when securing book cases. When you are securing a book case, be sure to anchor it to the stud and not just the drywall. During a severe earthquake, the drywall itself is not strong enough to keep a book cases from falling over. You may consider using flexible fasteners such as nylon straps. This type of strap allows tall objects to sway without falling over, reducing any strain on the studs. There is also something called earthquake putty, (for example…Quake Hold! Putty), that can be applied to loose shelving at each corner bracket. Here is a step by step guide on how to secure your book cases. This also applies to other valuable furniture such as chinas, hutches, and armoires. Locate the wall studs using a stud finder. Secure the book case to at least 2 studs, depending on the size and weight of the book case. As an inexpensive option, consider using 4″ L-brackets and 3″ lag screws (available at all hardware stores). Place heavier books on the lower shelves to prevent them from flying around during an earthquake. If you have multiple book cases adjacent to each other, secure them together with L-brackets and other hardware. Do you have any follow up questions to caring for your books? Please go ahead and leave a reply below. My expensive first & signed edition books are not shelved and are not for display. I want to keep them as mint & immaculate as possible for a very long time. I wrap them by a special Japanese paper, swaddled by multy-layers of bubblewrap until they look like puffed up cushions. Every cushion is laid horizontically in a special antistatic plastic box previously used for storing electronics. From time to time I open them, enjoy their wonderful look, give them some air and then – back to their “captivity”. This is my way to keep them out of damaging light, oily fingers and other plagues. I do not mind not to show them to anybody. It’s not my thing. They are always my nested babies. is it okay to put them in an unsealed zip lock baggie to prevent shelf wear? Yes it is. Most should already come with a publisher issued or aftermarket slipcase (or tray case) so a zip lock bag may not be necessary.